Just how much larger do you think that TVs in the living room will get eventually that having a projector around is redundant just for screen size alone? We are not quite sure where the glass ceiling is set in terms of measurements, but one thing is for sure – LG has just edged closer to a new record. In fact, their latest offering comes in the form of a 77” Ultra HD curved OLED TV that might just set the tone for the next-generation TV market. You might get a sense of deja vu out of reading this, but that is because the South Korean consumer electronics giant rolled out a 55” curved OLED TV earlier this year at CES, leaving this 77” monster to debut at IFA 2013 instead. Needless to say, this bad boy from LG would clearly make it the largest OLED TV in the world at the moment, not to mention being the new flagship from LG at the moment, boasting some of the most advanced next-generation TV features in a single chassis. It measures a whopping 77” diagonally, where the large screen’s IMAX-like curvature would ensure that you, the viewer, has a field of vision which is filled more completely compared to a conventional flat-screen TV. 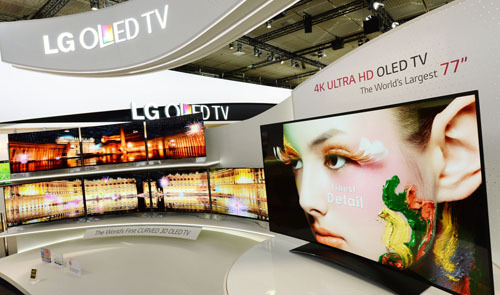 Not only that, it will also merge with LG’s exceptional WRGB OLED and ULTRA HD technology, which would let it deliver infinite contrast ratio and resolution that amounts up to four times greater compared to regular Full HD. No idea on pricing, but chances are pretty high you have got to pay for this through your nose – and more! I love LG’s new 77-Inch Ultra HD curved OLED TV. May I know the price range? Thanks for share! !